Add texture fills to AutoShapes in PowerPoint 2003 and 2002 for Windows. Other than solid fills and gradient fills, PowerPoint 2003 and previous versions also include three other fill types: textures, patterns, and pictures. On this page, we will explore the Texture Fills. If you want to see a sample presentation showing Texture Fills in PowerPoint, scroll down to the bottom of this page. Before we get into textures, its important to understand how they are different from pictures. After all, both textures and pictures are bitmaps from pixel based formats like JPEG, GIF, BMP, PNG, TIFF, etc. The main difference between textures and bitmaps is that while textures are seamless, bitmaps are not necessarily seamless. Seamless means that if you tile up a texture, it will not show any edges while tiling thus providing an illusion of a seamless expanse. 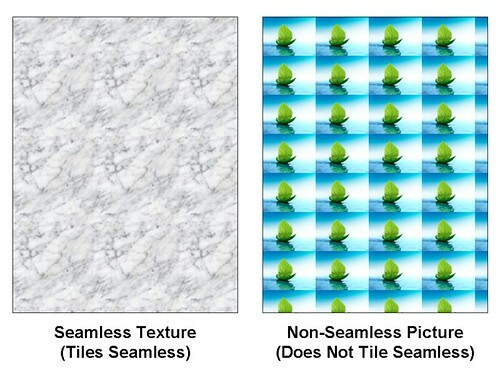 In Figure 1, the graphic on the left shows how a texture tiles up, while the graphic on the right shows how a regular bitmap that is not seamless tiles up. If you want to see the Figure below in a larger size, click on it to open a new window that shows a larger preview. PowerPoint includes 24 seamless textures which can be applied to any AutoShape, you can even import more textures that you can buy from third-party providers like Ppted.com. Related Link: Ppted.com has a great collection of textures that you can use in PowerPoint as AutoShape fills, look here. Select the AutoShape, and choose Format | AutoShape, as shown in Figure 2. Or double click the AutoShape. Either way, this opens the Format AutoShape dialog box that you can see in Figure 3. Note that this is a multi-tabbed dialog box, and all the options we need can be found in the Colors and Lines tab (again, see Figure 3). In the Fill area, click the downward arrow next to the Color option, and choose Fill Effects, as shown in Figure 4. This summons the Fill Effects dialog box that you can see in Figure 5. This dialog box has four tabs: Gradient, Texture, Pattern and Picture, select the Texture tab (again, refer to Figure 5). Choose from one of the existing textures, there's a scroll bar that reveals more textures. If you are using a third-party texture collection, such as the one from Ppted.com, click on the Other Texture.. button and choose a texture saved on your system. Click OK to apply the Texture Fill to the selected AutoShape(s), and get back to the Format AutoShape dialog box. Thereafter, click OK again to get back to your slide and AutoShape. Tip: The minute you use a third-party texture, PowerPoint saves it as part of the presentation. This brings us to another important piece of information: PowerPoint has a limit to the number of textures that you can use in any single presentation. In PowerPoint 2003, this limit was 200 textures. This is a sample of just a few textures from the Ppted Background Texture Collection.